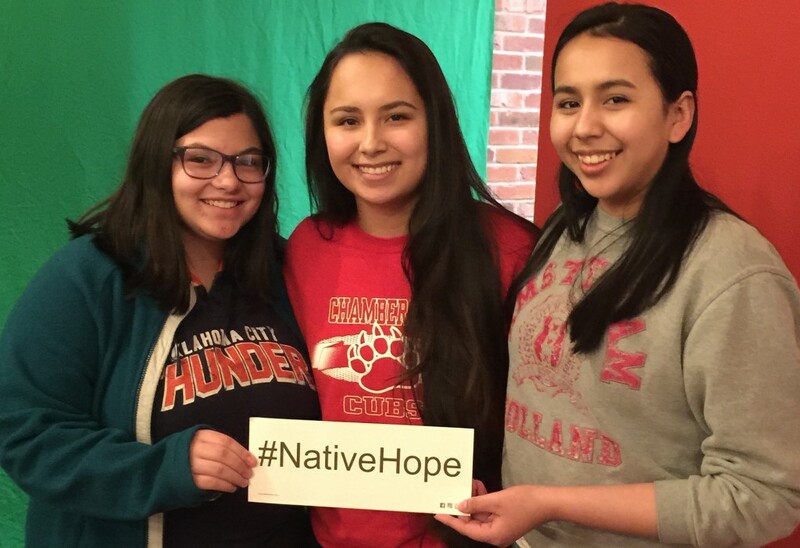 All of us at Native Hope continue to be passionate about actively empowering the next generation of Native American youth to pursue their dreams. Our Leaders' Society members were busy this past month as they headed to Rapid City for the He Sapa Healthcare Career Camp, learning about the tremendous opportunity they have to enter a career in the health field. They also continued their committment to weekly meetings at the Native Hope headquarters, encouraging one another and brainstorming more ideas on how to effectively reach their community. Earlier this year, Native Hope was invited to the University of South Dakota campus to speak to the American Indian Science and Engineering Society (AISES). The group was interested in learning more about the work of Native Hope and also gaining some insight into what life was like growing up on the reservation. With a room full of young college students, Kansas Middletent, Native Hope Ambassador, presented the "Untold Story of America"—an intriguing recap of the past, present, and future of the Native American peoples. Regarding the presentation, Tamee Livermont, USD American Indian Science and Engineering Society President, says, "As a Native American student attending the University of South Dakota, I appreciate the effort that Native Hope is making to instill hope in the younger generation. Kansas' testimony and passion to instill hope in the Native youth of SD was well displayed during his talk at our university. An inspiration to many, Kansas longs for the Native youth to appreciate and know that there is hope. Thank you for speaking at my school and inspiring others to join the movement and be the hope for Native youth across our state." After the presentation was finished, the young college students were asking questions about how to get involved. Many of them were very interested in working with our Leaders’ Society, and the brainstorming began. 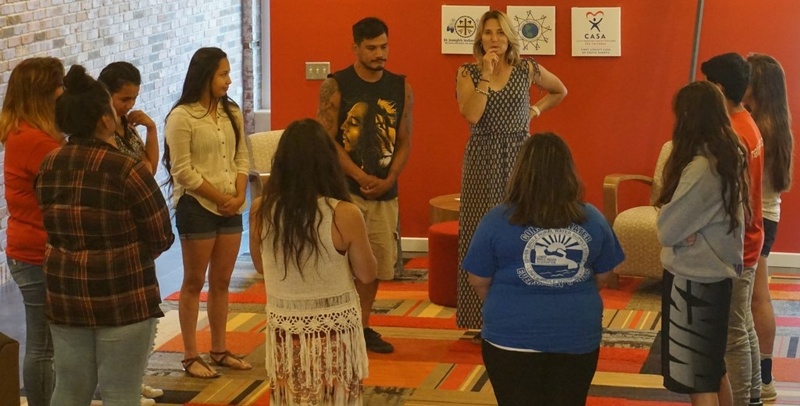 One opportunity that was brought up that evening was the idea of having the Native Hope Leaders’ Society participate in a summer camp that would allow them the opportunity to shadow different health-oriented professions. There is a significant decrease in Native Americans who have careers in the health field. The He Sapa Healthcare Career Camp was an opportunity for high school-aged Native American students to get a glimpse of these desperately needed job fields, and it was something that students from a poverty-stricken area wouldn’t normally have the opportunity to experience. The four-day camp was sponsored by the Sanford School of Medicine at USD, but the students resided at the School of Mines in Rapid City, SD. The days were full of visits and tours to the Rapid City Regional Hospital, Western Dakota Technical Institute, Sioux San Hospital, and the Indian University of North America to visit with other Native Americans who were working in the field of medicine. In their free time, the students had the opportunity to play pool and foosball with some new friends. Also, the camp had some fun outings planned, such as a visit to Rush Mountain Adventure Park and a tour of the Crazy Horse Memorial Park. At the recent Native Hope Leaders' Society meeting, a round of Thumball and a game of Conversation Dice created lots of laughter for the 12 young men and women in attendance. These leaders are learning that building a sense of belonging and friendship enables them to communicate their ideas and to make progress toward forming a viable society. Currently, the leaders are creating a feathering system that will reward members for their accomplishments. The mentors will return to the next meeting with a proposed model based on the input that has been gathered from the students. Recognizing the young men and women on things like attendance, grades, athletic and academic accomplishments, employment, participation in other groups, and more are all considerations for the system. Earning a set amount of feathers will mean students will have opportunities to attend conferences or trainings. Several ideas for community service and involvement were also discussed at the meeting. Kyal, the Native Hope Leaders’ Society mentor, reminded the group that they could volunteer every Tuesday night with the newly established Little League on the Lower Brule Reservation. Also, ideas for helping with the clean up of grave sites, working to support a suicide prevention task force, and assisting with a reservation fishing tournament were also discussed. Bottom line: These young leaders have tremendous ideas for art shows, juice stands, basketball tournaments, and even a "Get to Know Your Elders” event. They want to make a difference in their respective communities. It will take all of them working together to pull off their goals, but they are determined to do so!